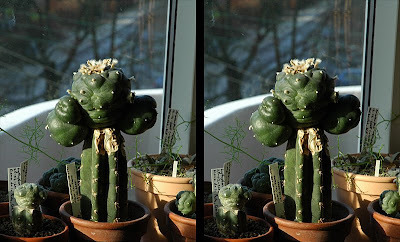 The next stereo pair is in the "cross-eyed" format. This type of stereogram can be difficult to view until you get the technique right. 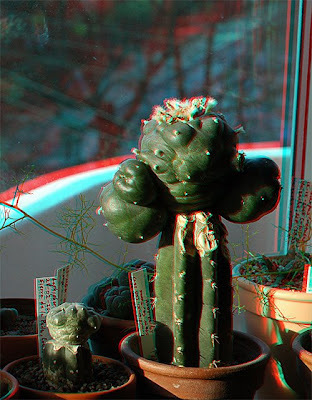 However the color rendering is bright and accurate, something not easily achieved with anaglyphs. Open the image in a separate, maximized window for the best viewing experience. 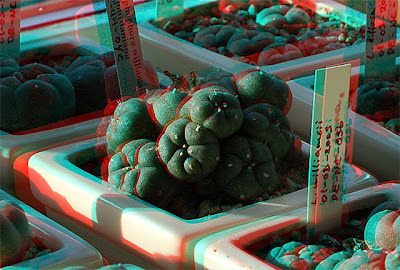 While I was at it, I also made an anaglyph stereogram showing one of my Lophophora jourdaniana plants. 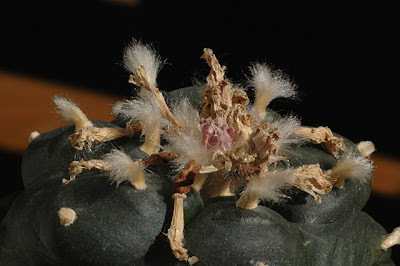 I have just started my first batch ever of Pelecyphora aselliformis from seed and found this a good opportunity to post on plate 6061 from Curtis’s Botanical Magazine describing this peculiar species. 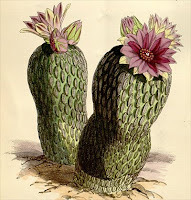 Curtis's Botanical Magazine has been published continuously since 1787 and is the longest running botanical periodical featuring color illustrations of plants. 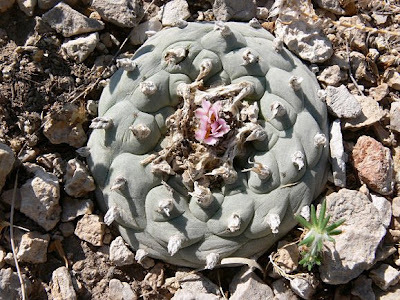 Below you’ll find what the magazine had to say on Pelecyphora aselliformis back in 1873 along with scans of the original illustration as well as the accompanying descriptive text. 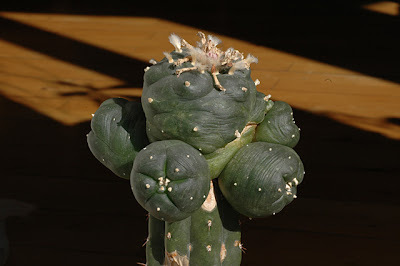 Genus PELECYPHORA, Ehrb. ; (Benth. and H. f. Gen. 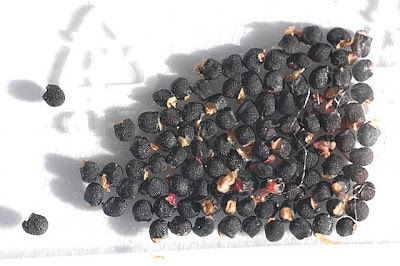 Plant., vol. i. p. 848). 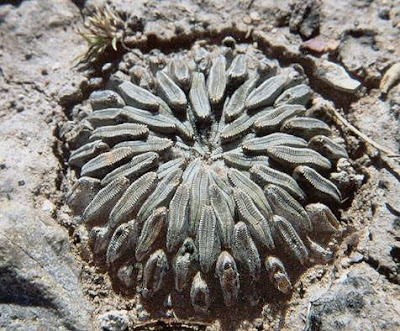 PELECYPHORA aselliformis; Ehrenberg in Bot. Zeit., vol.i. (1843) p. 737; Walp. Rep., vol. v. p. 822; Salm-Dyck Cact. in Hort. Dyck. cult. 5, et adn. 78; Först. Handb. der Cact. p. 257; Labouret. Monog. Cact. p. 148. Illust. Hortic., vol. vi. t. 186. 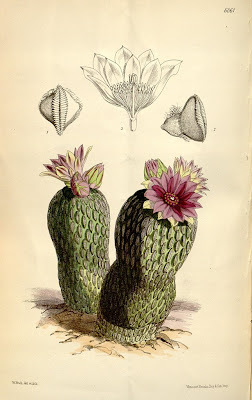 This remarkable and still very rare plant, has been long known amongst Cactus growers, and has in fact been in the trade for many years, having been imported by the brothers Tonel from Mexico, where it was said to have been found with the equally anomalous Cactaceous genus Anhalonium, (Ill. Hort., vol. xvi. t. 605 a). 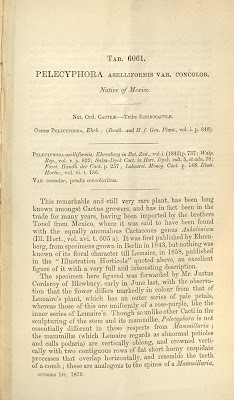 It was first published by Ehrenberg, from specimens grown in Berlin in 1843, but nothing was known of its floral character till Lemaire, in 1858, published in the “Illustration Horticole” quoted above, an excellent figure of it with a very full and interesting description. The specimen here figured was forwarded by Mr. Justus Corderoy of Blewbury, early in June last, with the observation that the flower differs markedly in colour from that of Lemaire’s plant, which has an outer series of pale petals, whereas those of this are uniformly of a rose-purple, like the inner series of Lemaire’s. 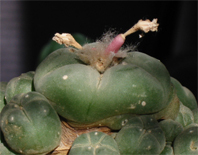 Though so unlike other Cacti in the sculpturing of the stem and its mammillae, Pelecyphora is not essentially different in these respects from Mammillaria ; the mammillae (which Lemaire regards as abnormal petioles and calls podaria) are vertically oblong, and crowned vertically with two contiguous rows of flat short horny cuspidate processes that overlap horizontally, and resemble the teeth of a comb ; these are analogous to the spines of a Mammillaria, but instead of being free and projecting, they lie flat, and are adnate to the ridge of the mammilla. 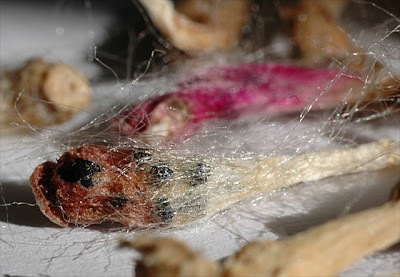 This double series resembles curiously a wood-louse, with which insects the plant seems covered, and which fact has given it the trivial name of aselliformis. DESCR. 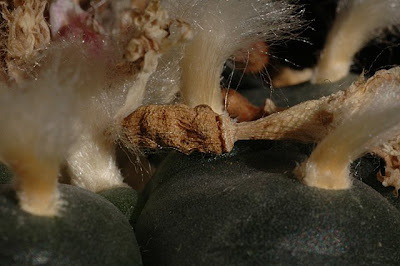 Stem tufted, dark green, shortly cylindric, three to four inches high, one and a half to two inches in diameter, often constricted about the middle, apex rounded. 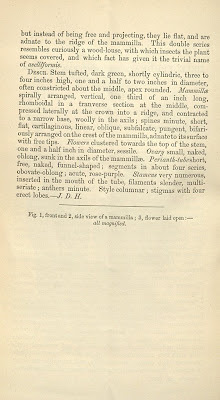 Mammillae spirally arranged, vertical, one third of an inch long, rhomboidal in a tranverse section at the middle, compressed laterally at the crown into a ridge, and contracted to a narrow base, woolly in the axils ; spines minute, short, flat, cartilaginous, linear, oblique, subfalcate, pungent, bifariously arranged on the crest of the mammilla, adnate to its surface with free tips. Flowers clustered towards the top of the stem, one and a half inch in diameter, sessile. Ovary small, naked, oblong, sunk in the axils of the mammillae. Perianth-tube short, free, naked, funnel-shaped ; segments in about four series, obovate-oblong ; acute, rose-purple. Stamens very numerous, inserted in the mouth of the tube, filaments slender, multi-seriate ; anthers minute. Style columnar ; stigmas with four erect lobes.---J D. H.
Fig. 1, front and 2, side view of a mammilla ; 3, flower laid open:- all magnified. The scans are courtesy of the Botanicus Digital Library, Missouri Botanical Garden and are free for non-commercial use, as long as attribution is provided.